With our first harvest being very small and green, the only suitable pickling method was to use lye treatment. So off we went to Farmlands to buy sodium hydroxide (good old caustic soda for those who don't know). But beware - the caustic soda you buy in shops as a cleaner and to unblock drains, contains only a percentage sodium hydroxide. The rest is made up of other chemicals which might not be suitable for human consumption. The gist of the lye-cured process is basically as follows: prepare the lye solution (2 ounces of lye to every gallon of cold water), cover olives with mixture, stir every 2 hours, test penetration occasionally by cutting an olive towards to pip - the lye will colour the flesh yellowish, leave in the lye for about 10-12 hours or until the process is complete and the flesh is evenly colored to the pip. For the next few days (from 3, but up to 8 days), wash the olives in fresh water, by replacing it twice daily until the soapy taste is no longer present. Prepare a brine (4 ounces of pickling salt to 1 gallon of water) to cover the olives with. Let them stand for 2 days. They are now ready to eat. 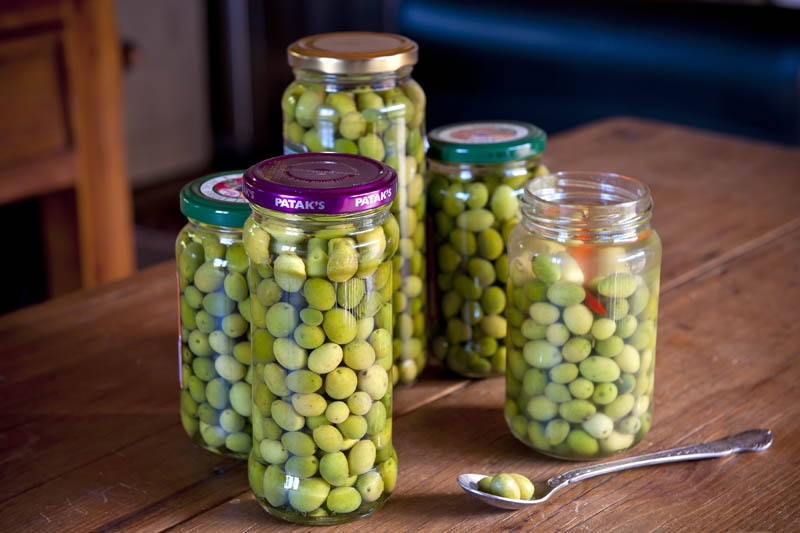 Pour a tipple and taste you first homegrown, homemade olives! Five bottle of our own cured green olives. A mixture of Manzanillo, Ascolano, J5, Frantoio and SA Verdale. I added pickled chillies to the one bottle to jazz them up a bit. 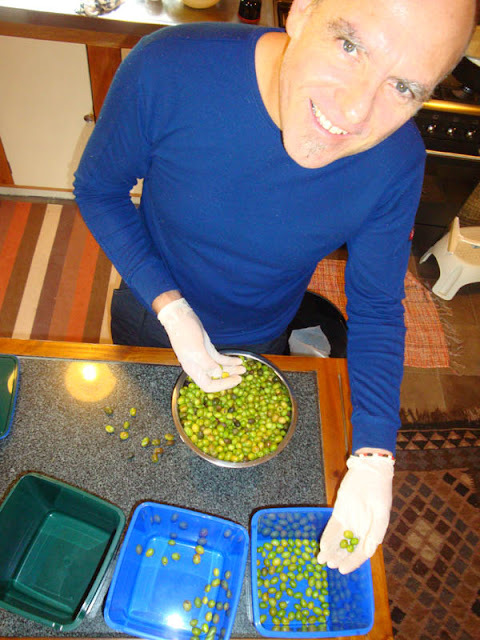 Apart from our own harvest, we were also very fortunate to get some olives from David to experiment with. 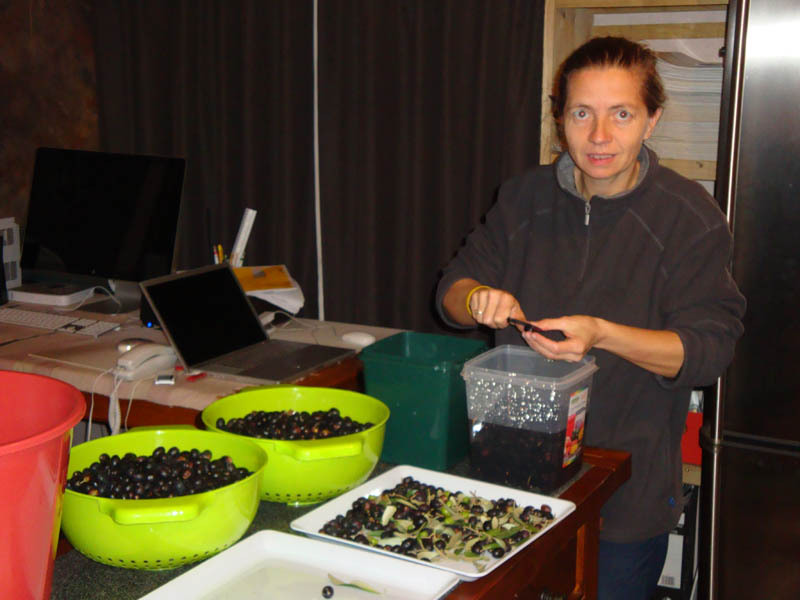 We drove through to Kapiti late one morning, each with a bucket in hand, and started picking Leccino olives. They were fairly ripe already with some starting to become wrinkly. The weather turned a bit nasty and before too long, I was one giant goosebump, not having brought enough warm clothes with. We wrapped it up after a couple of hours (with me feeling slightly hypothermic) and left happily with two buckets, three-quarters full. Thanks David for your kind offer! We now have enough to experiment a wee bit with the different processes. We decided to try out three options: 1) water-cured, Kalamata-style, 2) brine-cured, Greek-style olives and 3) dry-salt cured olives. Most of these are still in progress, so watch this space for updates. Making a slit in the olives for the water-cured Kalamata-style method.